During one of the Syrian campaigns of Tuthmosis III, the city of Joppa was captured by the Egyptians - this was achieved by one of Tuthmosis III's generals - Djehuty. It was the capture of Joppa that would give Djehuty national fame at the time and a story that echoes of the story of 'Ali Babba and the Forty Thieves'. The capture of the city, and Djehuty's later rewards from Tuthmosis III, were documentated on the Papyrus Harris 500 (now housed in the British Museum). At first the Egyptians attempted a direct assault upon the walls of Joppa, which failed - Djehuty then smuggled 200 of his soldiers who were hidden in baskets, the soldiers guarding the city of Joppa were made to believe that the baskets contained treasure captured by the Prince of Joppa. 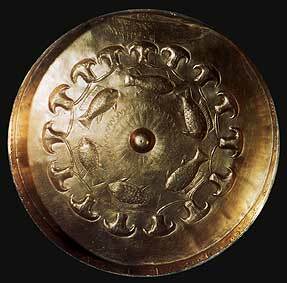 Once it was dark the Egyptian soldiers emerged from their baskets, opened the city gates allowing the city to be taken. Click HERE to read the full text of the taking of Joppa. "In the winter of 1824 a discovery was made in Sakkara, a tomb enclosing a mummy entirely cased in solid gold, (each limb, each finger of which, had its particular envelope inscribed with hieroglyphics), a scarabeus attached to a gold chain, a gold ring and a pair of bracelets of gold, with other valuable objects". 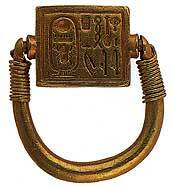 ring inscribed with the prenomen of Tuthmosis III; Menkheperre 'beloved of Ptah-beautiful-of-face'. 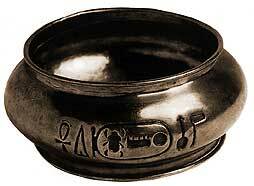 One of the two bracelets found in the tomb - the name of Tuthmosis III is on the side (probably implying it was a personal gift from him to Djehuty).